Stirrups are a major piece of tack and a major focal point for all new riders. 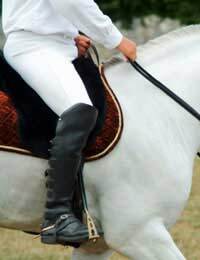 The English style of riding is not actually possible without stirrups. Stirrups are as integral to riding as the saddle. There is a right and wrong way to both fitting a stirrup and to using it and new riders should be taught both correctly. The more advanced a rider gets in horsemanship the more likely it is they will be expected to know how to put the stirrups on. Not every rider will have their stirrups at the same length. They come in many different lengths for a wide variety of reasons. Beginners will start with a long stirrup as this is safest and gives them the most stability against the horse. A long stirrup also means the rider is less likely to overbalance and they can be more precise with their leg instructions to the horse. It is for this very reason that dressage riders use long stirrups – so they can exercise the maximum degree of control over the horse through the legs – needed for the precise movements they have to demonstrate. Showjumpers use a shorter stirrup though as this makes them more able to rise up off the saddle. They can push forward into what is known as a forward seat. Jockeys use the shortest stirrups of all as they do not need too much communication with the horse but they do need to be able to stay off the horse’s back as much as possible. The stirrup itself, which is usually known as the stirrup iron, is made of metal. The type of metal varies but is usually steel – it is less likely to be iron itself nowadays. The main thing is that it is a sturdy metal which will not be compromised when a lot of weight is put on it. The stirrup leathers which attach to the saddle are, unsurprisingly, made of leather. It is vital that this is the strongest type of leather available as the leathers themselves will often be supporting practically the whole weight of the rider when they are raised up from the horse. Beginners learn of the importance of the stirrup from the very start of their riding career, as they are used in mounting and dismounting. But their importance strays well beyond this. The rider gives instructions to the horse via their legs and stirrups. Most riders are taught to put the ball of their foot on the stirrup bar, although some put the foot further forward. Whichever method you choose, it is important for the rider’s boot to have a heel to stop the foot from slipping all of the way through the stirrup and causing an accident or injury. The stirrup, like the saddle and the reins, is one of the first things a beginner rider must learn about. Also, like reins, stirrups are a vital tool in both communicating and controlling the horse and their importance should never be underestimated. Thank you for article.Could you elaborate more on why we use stirrups.Every search of "why we use stirrups" only gave afew sentence explanation for the importance of it and then quickly more on to something else. On the other hand, the search results for "why we need to ride WITHOUT stirrups" was practically limitless.If riding without stirrups seems to be more important than with, why is the "why" of riding with stirrups treated in artiles like the distant cousing of riding, yet this is the preffered method of riding on all disciplines?It might sound like a silly question, but I'm just very curious.Some articles make stirrups sound like bicycle training wheels there just incase of an emergency.Is the answer just that simple?Thank you so much!